Today's post is dedicated to love, its joy, its mystery, its humor, and its passion. Five of the images shown here are of artwork created by San Diego artists who have already been featured on this site. Feel free to click the link of their names to reach their feature article. 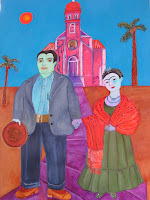 The remaining two artists also live in San Diego but are new to the site. 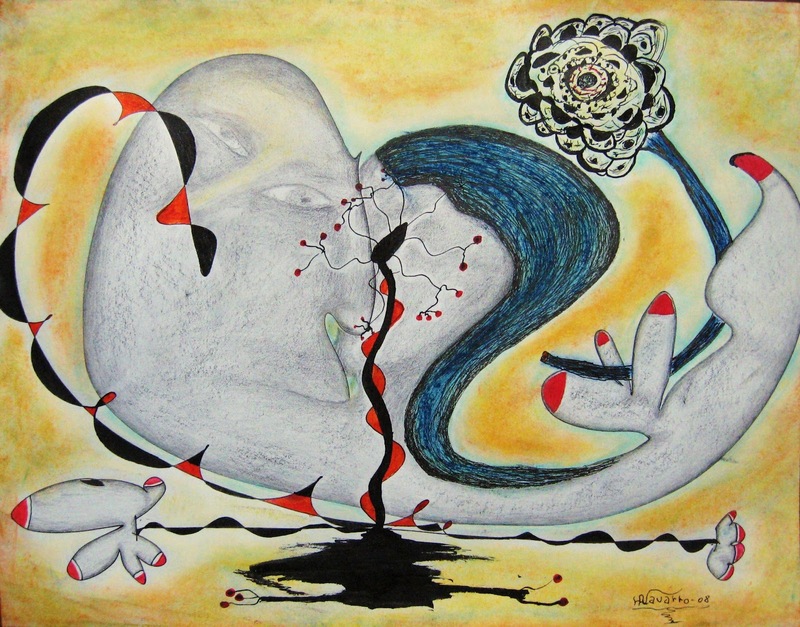 Our first image is that of a painting by Lupita Shahbazi. 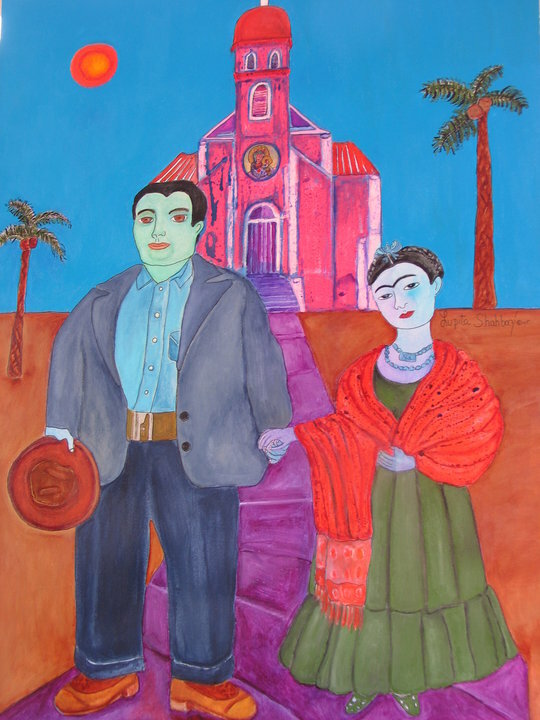 It is one of her Frida Kahlo portraits, and one that shows a perfect harmony between lovers. The title, The Elephant and the Dove, denotes the differences in physical size as well as the difference in styles between Kahlo and her artist husband Diego Rivera. And no one can deny Shahbazi's rich waxy colors. We can almost feel the scorching heat of the day. Or is that just how it feels to be in the presence of these two? 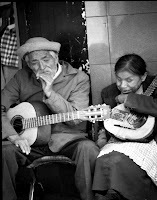 The photo on the left was taken by Alejandro Chernovetzky during his Glances of Mexico series. Though he also is a wonderful painter, Chernovetzky's photos are staggering in their intimacy and uncanny ability to project scenes rich and meaningful for the public at large. 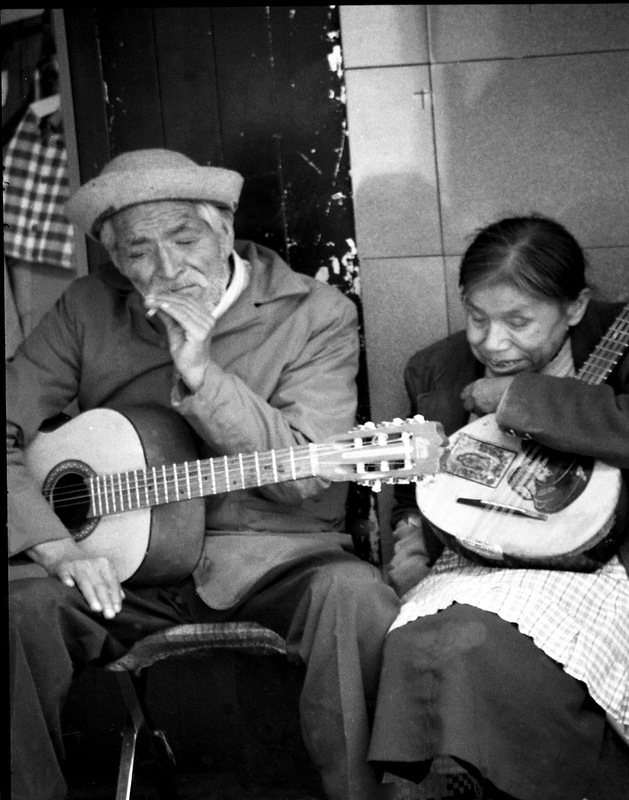 Even though the pictured couple is on a break between songs, we can clearly hear the magic of their unity. 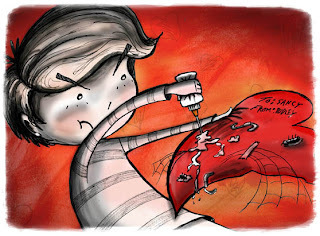 The image above was drawn by Hugo Navarro using graphite, charcoal, and Chinese ink. 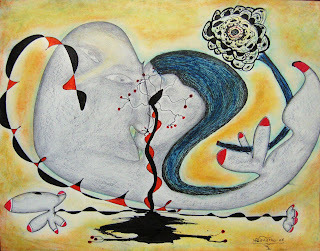 It is a part of his series titled The Lover. We are invited into the thoughts of the male because of his nearness to us, and his askance look at us. Swept off his feet, flowers of new variety bloom around the entwined lovers, and the air is suffused with a tarty citrus yellow. 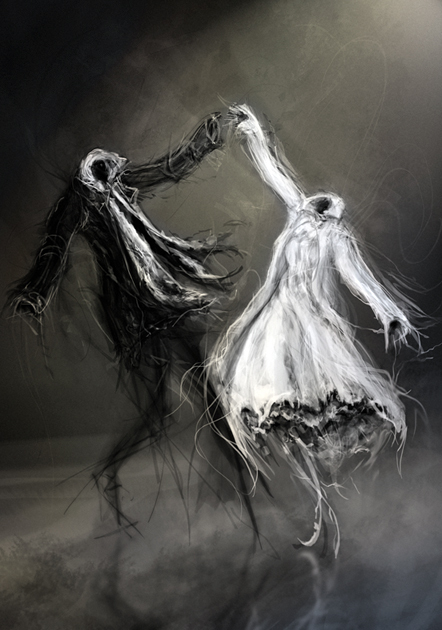 This is Arnaud de Vallois' first piece featured on YowzerYowzer. Through developing his digital art, de Vallois has already created some pretty fabulous pieces. He specializes in spooky imagery akin to that found in the horror and genre, and this piece, Glad Rags, keeps some of that feel. But its ability to evoke also a sweet charmingness makes for some delightful viewing. Great title too. Sergio "Surge" Hernandez created the graffiti piece, pictured above, at night as part of a New York street art project. 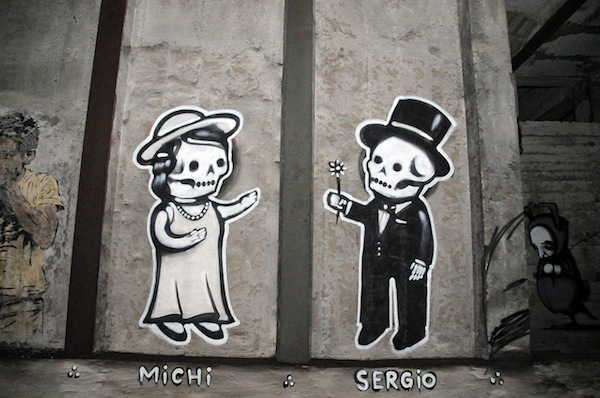 "I did the piece for Underbelly for my wife Michi," says Hernandez. "I usually try to avoid imagery relating to the Day of the Dead, but it seemed appropriate for that project because it was in an abandoned subway tunnel in New York." As Dia de los Muertos skeletons, Hernandez and his wife are dressed chicly in tux and full-length gown. Passing a dainty flower to his eager bride is a clear sign that their love is the immortal kind. The above image was created by Anna Guillotte for a story that was printed in the Los Angeles Times today, titled Dudley's Disgusting Valentine. Guillotte has been falling in love with Photoshop and this is one of her most digital works to date. Luckily, her vision remains as human and endearing as ever. The gorgeous piece at the left was made by a San Diego artist whose work is slated to be our next feature. For now though, let this teaser suffice. 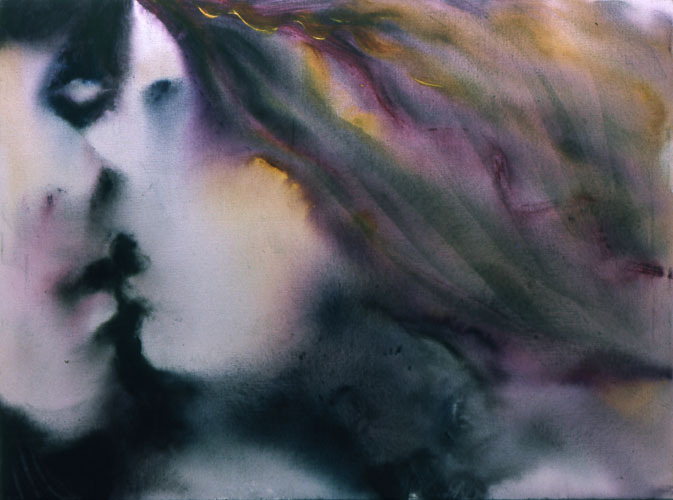 As part of a series by the artist entitled Two Women, its few streaks of color were laid down gracefully in a way that animates the lovers into living, breathing creatures of beauty, tenderness, and passion. Happy Valentine's Day, San Diego! And remember it's not the only day for love. It's just one of the peaks in the infinite mountain-scape of loving moments. Catch you in 6 days!